The Rugby Football Union has revealed ambitious plans to capitalise on their hosting of the 2015 Rugby World Cup and boost participation at all levels of the game. English rugby's governing body has vowed to invest £25m into 500 grass-roots clubs and a further £1m into qualifying 6,500 new referees and coaches and bringing 5000 volunteers into the game. The existing All Schools programme will be expanded to give a million children a chance to play rugby, with a target of introducing the sport to 750 secondary state schools by 2019. In addition, the RFU will step up their efforts to lure former players back to the game and encourage 15,000 new players to take up touch rugby. The legacy plans, that form part of a five-year strategy spanning the lead up to the tournament and beyond, also extend beyond the UK with the RFU keen to build links with 15 of Europe's developing rugby nations and to share knowledge. And their efforts to raise the profile of the game will incorporate a series of cultural programmes using art and photography to enhance the tournament and the sport as a whole. With a comprehensive plan to engage the nation that they hope will make "the oval ball the ball of choice", the RFU insists is has learned the lessons of the past with many critics previously pointing at their failure to build on England's World Cup glory of 2003. "The key learning from 2003 was that we didn't plan in advance. The coaches and referees just weren't there," said Steve Grainger, the RFU's development director. "Things like the coaches and referees just weren't there then, particularly coaches at the younger ages that were coming to the game. That is absolutely what we are doing now." The Union's hopes were underlined by a member of the squad that secured the sport's biggest prize in Sydney nine years ago - Jason Leonard. "The World Cup in 1991 was in England and we saw how the public's perception of rugby changed," he said. "But with the legacy planning for this World Cup, we are going to hit the ground running. It is getting volunteers and clubs involved. I think this will be the best ever World Cup and we have got to make sure we push that all the way through. This is a great opportunity for English rugby." The RFU hope to inspire a new generation of players, fans and volunteers and admit that the success of the national side will be key to that aim but it looks increasingly unlikely that Stuart Lancaster's side will stage games away from their traditional Twickenham base in a bid to bolster engagement due to the financial benefits of staging games at their 82,000 capacity HQ. "We need to look at methods of engaging with the World Cup around the country over the next three years. We have to think about ways of creating interest and getting people excited," said RFU chief executive Ian Ritchie. "We have to look at where do England play, when do they play? You would never say never but there is a strong financial reason why England matches are played at Twickenham. It is not just as easy as taking a match somewhere. There are all sorts of other things we can look at for games beyond the England senior team." 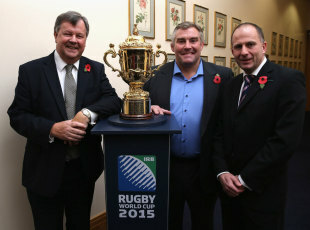 The RFU's plans have also been welcomed by Rugby World Cup Limited chairman Bernard Lapasset who said: "With three years to go until England hosts Rugby World Cup 2015, it is hugely encouraging to see such forward thinking and robust plans being implemented by the RFU to ensure that English Rugby at all levels benefits from hosting the event. "Not only will the legacy programme inspire participation leading up to one of the world's largest sports events, it will also enable the RFU to embrace and retain new participants long after the final whistle has sounded at the Rugby World Cup Final. This robust RFU work underlines the positive impacts for the host nation and the host region from holding Rugby's global showcase event."